The Estonian Society for the Study of Religions is calling for Papers for the 17th Annual Conference of the European Association for the Study of Religions (EASR) on Religion – Continuations and Disruptions from 25 to 29 June 2019 at the University of Tartu. Individual abstracts can be submitted to any of the pre-arranged sessions as well as to a generic, independent paper section in case one’s paper does not fit with any of the sessions that deal with more specific topics. The deadline for abstracts is 15 December 2018. The Religious Studies Media and Information Service (Religionswissenschaftlicher Medien- und Informationsdienst e.V., REMID) has recently published an article titled From agnosticism to secularism: A compilation of non-religious worldviews (Von Agnostizismus bis Säkular: Eine Zusammenstellung zu nichtreligiösen Weltanschauungen). The A-Z article covers terms like atheism, enlightenment, cultural Marxism and relativity of truth. The website and the article are in German. The German Association for the Study of Religion (DVRW) and the International Association for the History of Religions (IAHR) are calling for papers for a conference on Conceptualising Religion. The conference is held from 3-6 September 2019 at Leibniz University Hannover. The conference aims to look into the implications of diverse definitions of religion and the dynamics of conceptualisations within and outside academia. Contributions can be submitted from 1 December 2018. 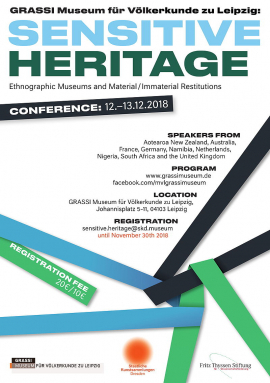 On 12 and 13 December 2018 the GRASSI Museum Leipzig will host a conference on Sensitive Heritage: Ethnographic Museums and Material/Immaterial Restitutions. The conference offers a platform to present international expertise to the State Ethnographic Collections of Saxony and the German ethnographic museum landscape with the dual goal of developing these insights towards their reapplication in other institutional settings, and of establishing restitution as ethnographic method. Please register until November 30th 2018 via sensitive.heritage@skd.museum.